In “The Fixer,” registrar Louise Krauss, who has a talent for repairing students’ lives, faces a situation that defies easy fixing. Carol will read from “The Fixer” at the Bethesda Magazine Awards Ceremony on April 26, 2019. To read the entire story, see the Winning Works page. In my latest short fiction, “Playoffs,” Stone and Becca face off, as the Caps fight for their lives in the NHL playoffs. I hope to see many of you at the First Annual Baltimore Festival of Jewish Literature at the Pikesville Library on Wednesday, November 14, 2:30-4 p.m. Together with Nadia Hashimi and Jen Michalski, I will be part of a discussion on “Bridging the Cultural Gap Through Literature.” This phenomenal festival is taking place at many different Baltimore venues, starting November 8. “Sheara’s Beautiful People” and “Driving Aunt Dellie” have been honored by the 2018 writing contests sponsored by Bethesda Magazine and the Bethesda Urban Partnership. Both works appear on the Bethesda Urban Partnership website and the Bethesda Magazine website In the short story “Sheara’s Beautiful People,” two lives intersect in an unexpected way at the local hair salon. In the essay “Driving Aunt Dellie,” a trip to the cemetery becomes a family reunion. Both works can also be found under the category “Winning Works” on this website. The Montgomery Writes Contest, sponsored by Montgomery Magazine and Novel Books, just named “A Recipe for Tzimmes” third-prize winner for Creative Non-Fiction. This memoir piece explores the significance of a baffling recipe for tzimmes, a beloved dish at our family seders. To see more, click other publications at www.carolwsolomon.com. “Wading in the Water” was recently published in the July 2017 issue of Pen-in-Hand, the literary journal of the Maryland Writers Association. Wading in the Water” is the third story in the Poolesville trilogy, which focuses on White’s Ferry and the ferry store. In this story, Elsie pulls Mo from the Potomac River and attempts to salvage two stunted lives. You can read my story online at the Pen-in-Hand website or in hard copy from Amazon. “Mother’s Day” was just recently published in Little Patuxent Review’s Winter 2017 “Prisons” Issue. In this short fiction, Kimmy is trapped inside her closet, while outside, her young daughters face unknown dangers. The Sydney Taylor Book Awards, sponsored by the Association of Jewish Libraries, honors new books for children and teens that exemplify the highest standards while authentically portraying the Jewish experience. The award memorializes Sydney Taylor, author of the classic All-of-a-Kind Family series. What a joy to talk with readers and potential readers of Imagining Katherine. 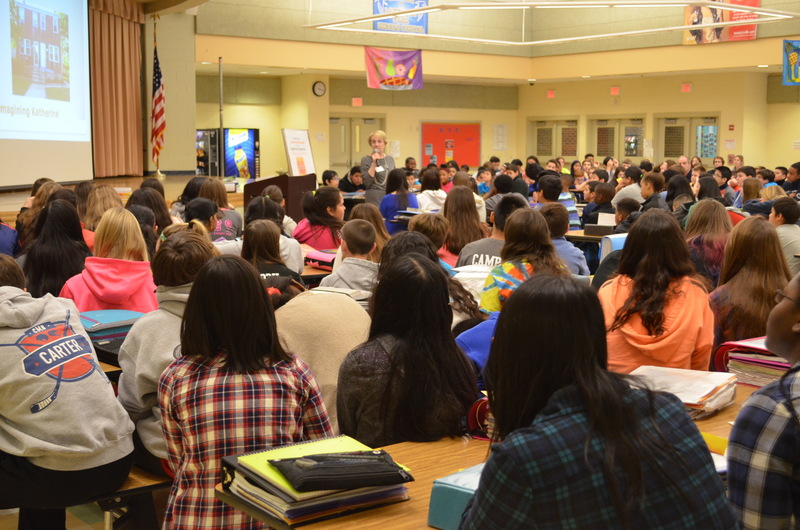 Yesterday I visited Lakelands Park Middle School and met with English classes in large groups and in a special creative writing session. The students were filled with provocative questions, and I was inspired by the imagination and enthusiasm of the Lakelands Park writers. Thank you Rui-Hung Tsai and Elissa Waldman for making this visit possible. Today I worked with ESOL students at Blair High School as they began to draft short stories. One of the students has been in the United States for only a few weeks, others for less than two years. I was touched by the poignancy of their stories and their determination to succeed. A special shout-out to Rafealla, Leona, Olly, Nathal, and their fabulous teacher Dr. Dana Simel. My adult readers have been the greatest surprise. While I set out to write a YA book, adult readers have seen the humor and challenges of their junior high years in Imagining Katherine. During my visit to the Library of Congress Book Club, I was surprised by the intensity of the members’ recollections of their segregated school years. Our shared stories and life experiences bring us together–young and not so young–and remind me that the diversity of our country is its greatest strength.